Glass’s 7 p.m. CDT presentation at the Capitol Lake Visitor Center will be the primary opportunity for the public to interact with him. The evening will include a presentation by Glass as well as questions and answers with the audience, followed by a book signing. Books will be available for purchase. Glass will also be the featured speaker at the Pierre-Fort Pierre Rotary Club at noon on July 24. From 1:30-2:30 p.m. on the 24th, Glass will be signing his book at the Cultural Heritage Center. There is no admission fee to come to the book signing, and no formal presentation is planned at the afternoon event. 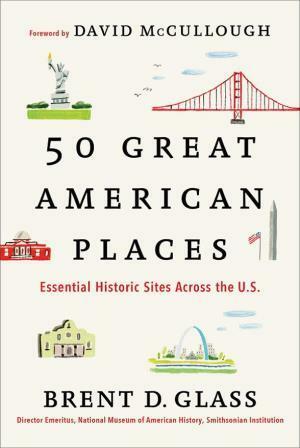 “50 Great American Places” is published by Simon & Schuster. Glass, a historian and the director emeritus of the Smithsonian’s National Museum of History, leads readers on a journey through 50 of the most important cultural and historic sites in the United States. Featuring a foreword from bestselling author David McCullough, this book is part travelogue and part collection of historical essays. Additional information about the events will be available on the South Dakota State Historical Society’s Website at history.sd.gov. The Museum of the South Dakota State Historical Society has been a Smithsonian Affiliate since January of 2013. Brent D. Glass is Director Emeritus of the Smithsonian’s National Museum of American History. A national leader in the preservation, interpretation and promotion of history, Glass is a public historian who pioneered influential oral history and material culture studies, an author, media presence and international speaker on public memory and museum management. Glass travels frequently as a featured speaker and participant in U.S. State Department cultural diplomacy programs and currently serves as a consultant and advisor to cultural and educational organizations including The Presidio in San Francisco, the DeVos Institute at the University of Maryland and Drexel University in Philadelphia. Before joining the Smithsonian, Glass served from 1987-2002 as executive director of the Pennsylvania Historical and Museum Commission, managing the largest and most comprehensive state history program in the country. Glass earned his doctorate in history from the University of North Carolina-Chapel Hill, a master’s degree in American Studies from New York University and a bachelor’s degree from Lafayette College. He lives in Washington, D.C.